Blue JG, Lombardo JA. Steroids and steroid-like compounds. Clin Sports Med 18(3):667– 689, 1999. Daly RC, y colegas. Neuroendocrine and behavioral effects of high-dose anabolic steroid administration in male normal volunteers. Psychoneuroendocrinology 28(3):317–331, 2003. Goldberg L, y colegas. Anabolic steroid education and adolescents: Do scare tactics work? Pediatrics 87(3):283–286, 1991. Goldberg L, y colegas. Effects of a multidimensional anabolic steroid prevention intervention: The Adolescents Training and Learning to Avoid Steroids (ATLAS) Program. JAMA 276(19):1555–1562, 1996. Goldberg L, y colegas. The ATLAS program: Preventing drug use and promoting health behaviors. Arch Pediatr Adolesc Med 154(4):332–338, 2000. Gottfredson GD, y colegas. The national study of delinquency prevention in schools. Ellicott City, MD: Gottfredson Associates, Inc., 2000. Green y colegas. NCAA study of substance use and abuse habits of college student-athletes. Clin J Sport Med 11(1):51–56, 2001. Leder BZ, y colegas. Oral androstenedione administration and serum testosterone concentrations in young men. JAMA 283(6):779–782, 2000. The Medical Letter on Drugs and Therapeutics. Creatine and androstenedione—two "dietary supplements." 40(1039):105–106. New Rochelle, NY: The Medical Letter, Inc., 1998. Middleman AB, y colegas. High-risk behaviors among high school students in Massachusetts who use anabolic steroids. Pediatrics 96(2):268–272, 1995. Su T-P, y colegas. 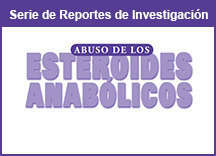 Neuropsychiatric effects of anabolic steroids in male normal volunteers. JAMA 269(21):2760–2764, 1993.